The classic road race movie The Cannonball Run was released on Jun 19, 1981, 30 years ago today. It starred Burt Reynolds, Dom Deluise, Roger Moore, Jamie Farr and a host of other celebrities like Jackie Chan, Farrah Fawcett, Dean Martin, Sammy Davis Jr, Terry Bradshaw and Adrienne Barbeau. The film was originally going to be a straight up action flick starring Steve McQueen. After McQueen’s death, the lead was given to Burt Reynolds and the script was re-written as a comedy. The race in the movie is based on an actual, real life race that took place over several years in the 70s. I discuss the origins of the real race; The Cannonball Baker Sea-to-Shining-Sea Memorial Trophy Dash here. Many of the vehicles, including the ambulance driven by Reynolds and Deluise, were actually entered and run in the real life Cannonball races in the late 70s. Roger Moore plays Seymore Goldfarb, Jr, a spoof of James Bond, who he was portraying at the time. In the race, he drives an Aston Martin which is famously linked to the British secret agent. However, Moore never drives an Aston Martin in the seven movies he appeared as James Bond. This movie is the only on-screen pairing of Moore and the famous car. This movie features one of Jackie Chan’s first US appearances. His character is Japanese, even though Chan himself is Chinese. Chan was inspired by director Hal Needham’s use of bloopers during the end credits and from this point on would do the same in all of his own movies. Burt Reynolds and Dom Deluise appeared together in Smokey and the Bandit Part II the previous year. This movie makes several references to that earlier movie including Reynolds mentioning the black Trans-Am and Deluise referencing his doctor character. The Cannonball Run had two sequels. The first was The Cannonball Run II in 1984. Part II reunited the majority of the cast from the first movie. The second sequel was Speed Zone in 1989. The only returning character in the third movie was Jamie Farr’s The Sheik. The two leads were John Candy and Eugene Levy, friends who appeared together on SCTV and in the movie Armed and Dangerous. Their casting was an attempt to recreate the chemistry of original leads, and friends, Burt Reynolds and Dom Deluise. This movie still holds up today. Reynolds and Deluise are hilarious and it seemed the entire cast had a blast filming the movie. Part II also holds up very well and fans may actually remember more scenes from Part II than the original. 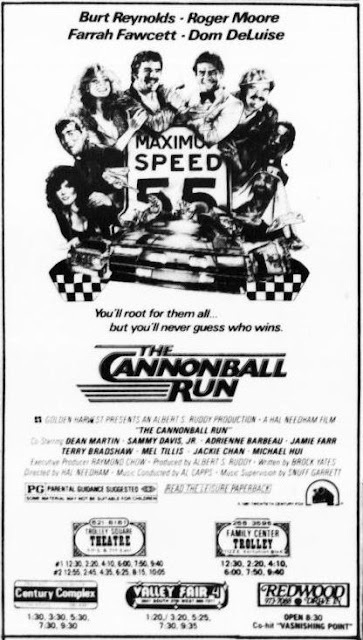 This entry was posted on June 19, 2011 at 8:00 am and is filed under 80s, Cannonball Run, movies, nostalgia, pop culture with tags anniversary, Cannonball Run, movies, pop culture. You can follow any responses to this entry through the RSS 2.0 feed. You can skip to the end and leave a response. Pinging is currently not allowed. Man i love this movie. Hard to belive its been 30 years. I was 7 when this came out…. What a truly incredible post!! !